This is one of the Berg’s big ones. 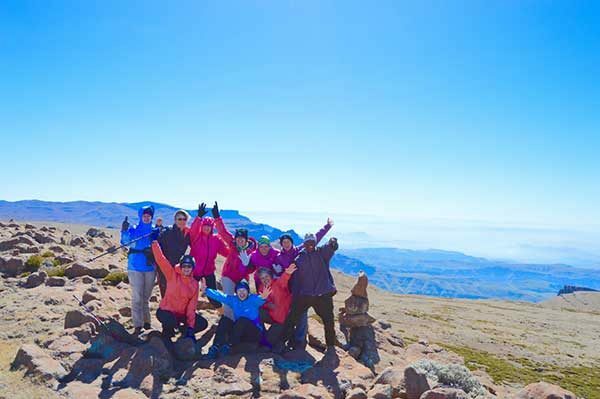 The main objective of this hike is to summit South Africa’s highest point, Mafadi (3450 meters above sea level). You will sweat but you will be very, very well rewarded. This is another one of those way-out-there Berg areas. Up we go with Judge Pass and down we come Leslies Pass. Some of the Berg’s icons are located in this area. The Trojan Wall, Injisuthi Summit Cave, Injisuthi Greater and Lesser Buttress, Injisuthi Triplets, Molar, Scaly Peak and Old Woman Grinding Corn are all out there for you to see. And the view looking up to the escarpment from the Centenary Hut is one to remember. 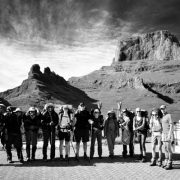 Look north all the way Cathkin Peak and all the way south to the Giant. This is nothing less than an accomplishment. Gear up and head for the trail. This is a longish day to the summit of the Little Berg. Comfortable camping at the Centenary Hut. Going up and up via Judge Pass. Reaching the escarpment’s summit is always a big day. You’ll be ascending about a thousand meters in only about three kilometers. Hard work on steep terrain. For what is to come your hard work will be worth every ounce of effort. Going up some more to South Africa’s highest point – 3450 meters above sea level. Once you’re there, just settle down for a moment and take it all in. You’ll have the province of KwaZulu-Natal at your feet and the Mountain Kingdom of Lesotho all around you. The scenery simply leaves you breathless and inspired. Tighten those boot laces and warm your quads, because we’re heading down, down and some more down. Leslies Pass is long and steep, so we’re using all day to get ourselves off the mountain. The overnight in Marble Baths Caves is very comfortable, relaxing and warm. And after your swim in the Marble Baths you’ll feel right at home. Quick one back to Injisuthu Hutted Camp. When to go: All year, best from March to May. Itinerary rating: Moderate to extreme. Not suitable for children and persons with very low fitness levels. 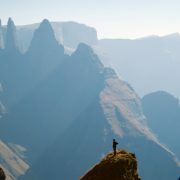 Other information: Reaching the Drakensberg’s summit is one of those things you have to visit at least once in your life. It is proper expedition style where all the necessary gear is required. This is the Drakensberg at its best. Rugged, tough, isolated and spectacular. Certain pieces of equipment are a must and moderate fitness levels are required. As far as possible we encourage guests to cater for themselves. This proves to be much more cost effective and practically it makes a lot more sense. Porters are available on request. All the relevant information will be provided, once an enquiry has been made. Points of interest: Thokozisa, Injisuthu Hutted Camp, Champagne Valley.